A wind of change is blowing through the world of compact hatchbacks! Very fashionable, Citroën C3 is characterised by a trendy and optimistic design, animated by coloured inserts and graphic elements like the Airbump® panels. Its expressive and unique shape makes it immediately recognisable in its segment. Style, personalisation, Citroën Advanced Comfort®, new technologies and ConnectedCAM Citroën ™. The light colour chosen for the interior of these storage compartments contrasts with the items being stored to make it easier to find them. Finally, there is no compromise on luggage space, the C3 has a boot volume of nearly 300 litres. ​Citroën C3 is also all about fashionable technology. A world first, Citroën offers ConnectedCAM Citroën™, a connected HD camera. This hatchback also offers a range of equipment that makes life easier for the driver: 3D connected navigation with voice recognition, reversing camera, Lane Departure Warning System and Blind Spot Monitoring. The ConnectedCAM Citroën™ on C3 means you can film spectacular scenery, unusual locations and cityscape. This new system uses a camera fitted behind the rear-view mirror to film what the driver sees through the car windscreen. It provides a video log of your everyday driving experiences: - Just click to take a photo and share it on social media. The camera films and stores what’s happening in front of you, so it could also provide valuable information in the event of an accident. ​The system recognises speed limit signs and gives this information to the driver. This speed can be used to set the speed limiter/cruise control. It works across the entire speed range. The system also detects signs indicating the end of the speed limit. 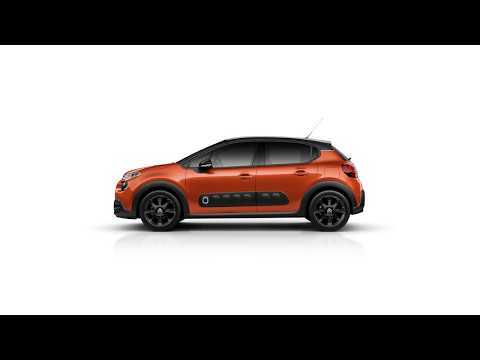 In the petrol version, C3 is available with a manual gearbox with the 3 cylinder PureTech 68, 82 and 110 (Stop & Start) engines, and in the Diesel version, with a manual gearbox with the BlueHDi 75 and 100 (Stop & Start) engines. To offer optimum driving pleasure and comfort, C3 will be available with an EAT6 automatic gearbox shortly after its launch .